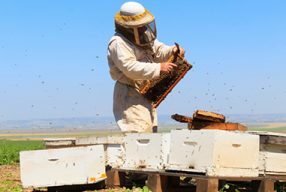 To prevent bee deaths, the BeeConnected app aims to improve communication between beekeepers and cotton growers regarding hive positioning and vulnerability to proposed crop protection product application. 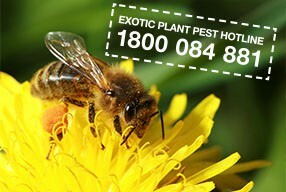 Cotton Australia, represent the biosecurity interests of cotton growers and the industry. In 2015–16, cotton production was valued at $1.3 billion (LVP). Australian cotton yields are high by international standards, at nearly three times the world average. Although a relatively small producer on the world scale, Australia sustainably produces high quality, low contaminant cottons that attract a premium on the world market. Almost the entire Australian cotton crop is exported, with the majority sold to China and the remainder mainly to spinning mills in other parts of Asia. Cotton is grown in most of the major inland river valleys of eastern Australia, in a belt stretching from central Queensland in the north, to the Murray Valley Area in Victoria, and Menindee Lakes in western NSW. Approximately 60 per cent of the national crop is grown in NSW, with the remainder grown in Queensland and a small number of fields in Victoria. Cotton is predominantly grown as an annual irrigated summer crop, with rain-grown cotton representing approximately 20 per cent of the total planted area. 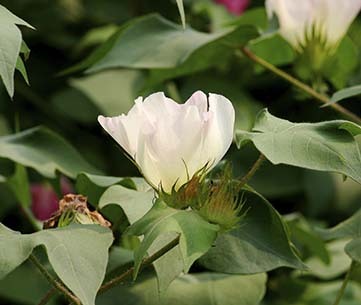 Cotton (Gossypium hirsutum) is grown worldwide for its soft, staple fibre that develops around the seeds of the plant into a form known as a boll. The shrub is native to tropical and subtropical regions around the world, including the Americas, India and Africa. For Australia, cotton is an important part of many regional communities, contributing around $1.7 billion to the national economy each year. In Australia, most on-farm cotton activities occur from September/October/November (planting) to March/April/ May (harvest). All Australian cotton is grown in New South Wales and Queensland on about 800-1000 farms, the majority of which are run by families. The major production areas in New South Wales stretch from the Macintyre River on the Queensland boarder and cover the Gwydir, Namoi and Macquarie valleys as well as along the Barwon and Darling Rivers in the west and the Lachlan and Murrumbidgee rivers in the south. In Queensland, cotton is grown mostly in the south, in the Darling Downs, St George, Dirranbandi and Macintyre Valley regions. The remainder is grown near Emerald, Theodore and Biloela in central Queensland. Cotton is commonly regarded as being a partially cross-pollinated crop, and largely self-fertile and self-pollinating, although introducing insect pollinators into the crop during flowering has resulted in increased quantity and quality of cotton lint. Each cotton flower is only available for pollination on the one day the flower opens, with the corolla and staminal column falling off on the second day. 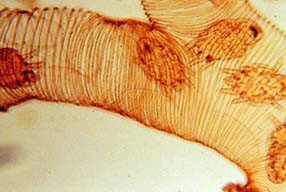 Nectar is secreted by floral nectaries inside the flower and by extra floral nectaries on the outer or sub-bracteal, foliar, and unipapillate (microscopic) areas on the flower peduncles and young leaf petioles, with all nectar secreting sites shown to be attractive to foraging honey bees. About 50 ovules must be fertilised if a full complement of seeds is to be produced; therefore, at least 50 viable pollen grains must contact the stigma. Insect pollination, in particular honey bee pollination, can aid in this process and result in higher yields and better quality lint. 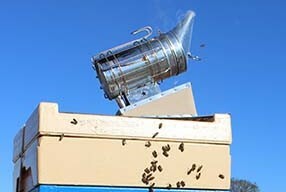 Benefits of honey bee pollination include increases in the percentage of bolls per 100 flowers, more seeds per boll, more seed cotton per boll and more seed cotton per flower. Improvements in lint quality characteristics such as fibre strength and length have also been demonstrated. 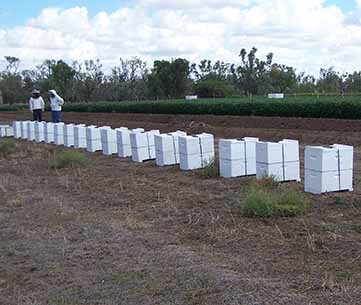 Despite studies recommending the use of honey bees on cotton crops, there is little in the way of recommendations as to honey bee management on cotton crops. However, from the studies conducted, one hive per hectare was used in some trials which showed significant improvements in quality and quantity of cotton lint and seeds. 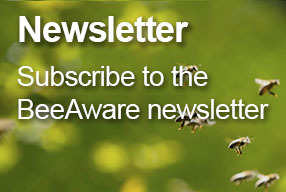 The text about pollination is an excerpt from Cotton – pollination aware fact sheet (2010). Rural Industries Research and Development Corporation, Publication No. 10/119.